But first, following the Pledge of Allegiance and the singing of the national anthem, the gathering began with Anne Fox, president of Massachusetts Citizens for Life, giving a report to the crowd, rousing them with a recitation of the reasons for renewed hope that pro-lifers have at the advent of the Trump administration: International Planned Parenthood defunded once again; Planned Parenthood in the US likely to follow; Obamacare on the way to repeal; at least one and maybe a second pro-life US Supreme Court justice likely to be appointed; and more. At each statement, the assembly applauded and cheered. Of course, those who oppose us in this effort will not go quietly into the night and that was clearly in evidence on Sunday as well. Some pro-abortion agitators had dispersed themselves amongst the crowd and at the end of Anne’s talk they rose and began screaming, chanting their demand for “free abortions” and that “abortion is healthcare”. 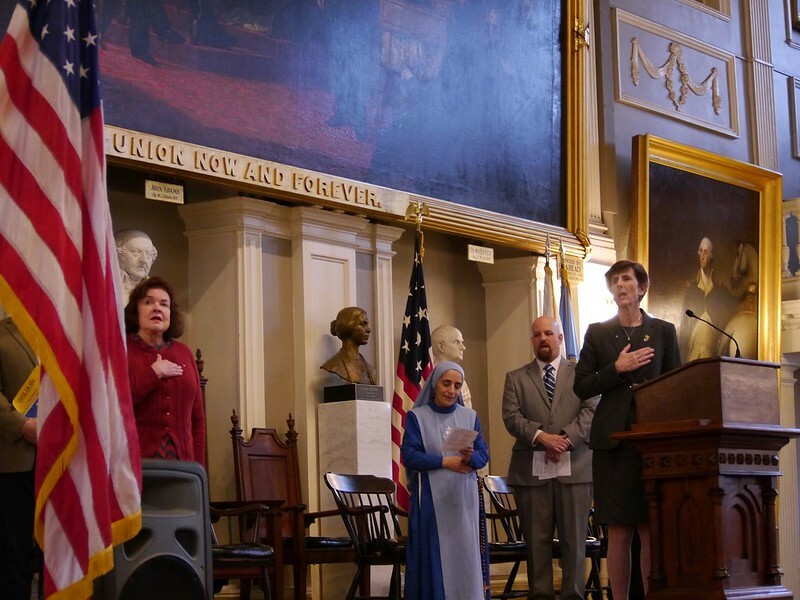 While they were removed by Boston police, the keynote speaker, Mother Olga Yaqob, led the assembly in a spontaneous and continuous prayer over the disruptors. Once order was restored, Mother Olga was introduced properly and she began her speech. The tiny Catholic sister—she had to stand to the side of the podium to be seen—spoke softly but with strength of her youth in Iraq, enduring four wars there as she began medical school but then left to serve the poor, weak, and vulnerable so prevalent in her country. In 2001, she came to the US and in 2011, after becoming an American citizen, founded a new community of religious sisters in the Archdiocese of Boston, the Daughters of Mary of Nazareth. Mother Olga acknowledged those who have been calling for their “right” to abortion and others who express fear at the loss of other “rights” if abortion is outlawed or if doctor-prescribed suicide is banned. She then recounted several anecdotes related to her ministry of uniting faith and science and a care for all persons. Mother Olga spoke of spending days in a labor and delivery room with a woman from a home for women in crisis pregnancies, never leaving her side despite being urged to take a break by hospital staff because the young mother had no other family to be with her. Another woman from the home went through hours of labor only to to be told she needed an emergency c-section and Mother Olga stayed with her, even in the operating room. At one point, the surgeon turned to Mother and said, “Mother, now you really have to pray,” and so she knelt by the young woman’s head and prayed for her and her baby. Those doctors and nurses, Mother Olga told the rapt and very quiet audience, did not see that baby as mere tissue, but as a baby, a fully human person to fight to save. She also spoke of another young woman she happened to encounter on the street one night, who was distraught and perhaps even a danger to herself. She said she called around to 25 different places, searching for an open bed in a program that could help her. Even as Mother Olga went from place to place in the rain, she was asked over and over how she knew this young woman. “I just met her,” Mother would say. But nevertheless, she loved her as she would a sister or daughter. Following Mother’s talk and an interlude of peaceful and beautiful music on guitar and flute provided by Eric and Patricia Anthony—Eric being a descendant of pro-life suffragette Susan B. Anthony—a recording of the Mildred F. Johnson Oratory Contest winner for last year, Isabelle Germino, was played. Isabelle is at university now, but sent along her winning speech on the slippery slope of doctor-prescribed suicide and euthanasia. In between, the day’s emcee, Cindy Dorsey, kept the crowd energized and amused. At one point she related how she’s the daughter of strong Boston Irish Catholics who loved children and had very many of them. She said that someone once asked her mother when she would stop having children and she replied, “When the babies stop being so beautiful.” Cindy said she and her brothers and sisters loved to rib their youngest sibling over that one. Finally, to end the program, Cardinal Seán O’Malley, archbishop of Boston, addressed the Assembly. He had arrived late from another gathering and said he’d been sorry to miss the protesters. Cindy assured the cardinal, “Don’t worry, Your Eminence, Mother Olga had your back.” The cardinal then spoke for a few minutes on being people of mercy, bringing light and love to a world desperately in need of it. He recalled that on that very morning he’d been to see a young man in his 30s with Lou Gehrig’s disease in the hospital, surrounded by his wife and son and extended family. He went to provide the sacrament of anointing to the sick and said how inspiring it was to see how the man was being cared for. He noted that in the ritual for the anointing for the sick, one of the Gospel readings is of the young paralyzed man whose friends opened the roof of the building where Jesus was praying to lower the man down to receive Jesus’ healing. After the cardinal’s talk, he led the assembly in a final prayer and then the assembly sang one last time together with a rousing rendition of the “Battle Hymn of the Republic,” which seemed most appropriate in a venue so steeped in the history of the fight for freedom, surrounded by the portraits of patriots like George Washington and Samuel Adams. Because if a ragtag band of freedom-lovers scattered along the coast of a new land could stand up to the most powerful empire on Earth and wrest from it the freedom to found a Republic destined to itself become the most powerful and free and prosperous nation in the world, then it seems possible for this pro-life movement of mothers and fathers and students and grandparents and people from all walks of life to bring about an end to legalized abortion and assisted suicide in this country too. The 44th Assembly for Life ended in the hope and peace which is was intended to bring. Those who gathered on Sunday left the venue with a renewed sense of purpose to bring love and mercy to a world that needs both and to do so in the service of the most vulnerable in our country. Click above for more photos of the event.